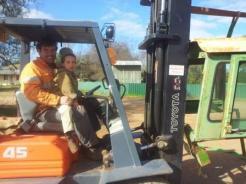 CWFS was fortunate to receive funding from the Woolworths Sustainable Farming Grant and Landcare Australia last year to purchase a Greenseeker. CWFS aims to provide information on Greenseeker technology and its use as a tool in managing profitability and risk. Recent survey results reveal that a major driving factor that has limited farmer participation to date in adopting farming technology and techniques is the confidence they have in their own knowledge/skills to adopt this technology and technique. As part of this project farmers will have access to the results of trials on established ‘farming champion’ case study farms that CWFS have demonstrating various types of sustainable farming practices. These ‘farming champion’ farm operations will cover several CMA regions of NSW. These selected sites will provide a hands-on insight as to what is achievable at a farmer level, with varying rainfall distributions looking at water use efficiency of dryland and irrigated properties and nutrient management of cropping systems and overall farm productivity. This project will be run in conjunction with an existing CWFS funded project with Southern Precision Agriculture Association (SPAA) which will provide in-kind and funded contribution for farmers to demonstrate precision agriculture (PA) on-farm, such projects include using satellite imagery for variable rate application, yield mapping to determine compaction issues and soil constraints, control traffic farming technology through 2cm accuracy GPS systems and nutrient management decisions for crop water and crop production programs. Farmer field days in various areas will be held to demonstrate different management strategies that may be applicable to individual farming operations. 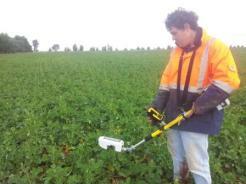 A hand held green seeker will be used as a decision support tool for variable rate technology with cropping inputs. The high value of using Greenseeker technology in making informed in-crop decisions is critical to efficient farming practices. The decision(s) as to what inputs should be implemented and the greatest return is crucial to the profitability of farming. The Greenseeker hand held is versatile, can be mounted on an ATV or tractor. To determine the accuracy of the greenseeker machine for monitoring crop nitrogen requirements as the season unfoldeds, and to identify levels of topdressing if required. Crops were monitored twice over the tillering stage. The Greenseeker machine works on reflection of light from the chlorophyll (green part of the leaves), the healthier the plant the higher the reading. Readings are done on the nitrogen (N) rich strip and compared to the rest of the paddock. – Quick and results are immediately available. – Readings can be repeated throughout the season to follow N availability to the crop. The only concern was its accuracy, as this system is not widely used in this area. Oriel is a farm north west of Parkes (Goonumbla) with an annual rainfall of 526mm. Nutrition is applied at sowing time for a yield potential of 3.0t/ha. The 2010 season presented opportunities for the yield potential to exceed 4t/ha. Therefore nitrogen rich strips (42L N/ha) were put applied to 14 paddocks across the wheat and canola area to determine how much additional nitrogen was needed as the season progressed. 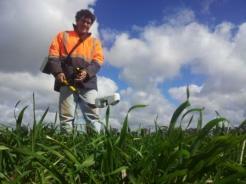 Soil tests were also conducted to compare to Greenseeker results. Nitrogen is best supplied to the plant as it needs it. Excessive nitrogen early in the plants growth will result in a bulky plant that may not finish its yield potential if faced with a dry period. Conversely a nitrogen deficient plant will not reach its yield potential, and nitrogen deficiency may not be identified until yield potential has already been limited. Therefore a topdressing program requires good triggers as to when nitrogen is needed and how much. Results from soil tests and tissue tests typically have a delay from sampling to results being returned. Topdressing is a practice that will form a big part of our cropping program. Gaining good numbers as to how much and when is critical to successful and efficient applications of nitrogen. This season there were many crops which showed signs of yellowing, even in the N rich strips, meaning that misdiagnosis of N deficiency could have occurred if the strips were not present. Topdressing is often an emotional decision based on the optimism gained from good rainfall and the occurrence of all the neighbours spending heaps of money on nitrogen and its application. Technology has presented opportunities for small amounts of nitrogen to be applied by a boomspray accurately, quickly and cheaply.